I knew my father’s family came from Sheffield but little else of the family’s history at the time Will started at University in 2005 but it was interesting how quickly he felt at home in this city of his ancestors and took so readily to the nearby Peak District that had beguiled my paternal grandparents – they met when they were both members of an early 20th century rambling group I believe and later named their house in Oxfordshire after Winnats Pass. This is a photo journal of that visit – a bit of a time lag since the visit, but what had begun as simple curiosity about the places my ancestors had known made quite an impact on me, so rather than just leaving the story and photos ignored on my computer I decided to include them here as part of my Placescape themed posts (‘place-portraits’), hopefully of interest to people who know the area. But it’s an acknowledgement too of my family’s hard work and their endurance through hard times and traumatic events, and, a (somewhat meandering) record for their most recent descendants, my two sons. The post also marks the 155th anniversary of a little known but major disaster that happened in Sheffield – more below. So, here’s a hotch-potch of snippets of the city’s history intertwined with some architecture, graffiti, several parks and graveyards, family trades and tragedies, and a bit of significant countryside. Moody view to Dark Peak from my AirBnB room in a delightful 1830s cottage in the village where several generations of my ancestors had lived, Norton Woodseats, and where my searching began. Once in Derbyshire it’s just 20 minutes south of Sheffield City Centre. 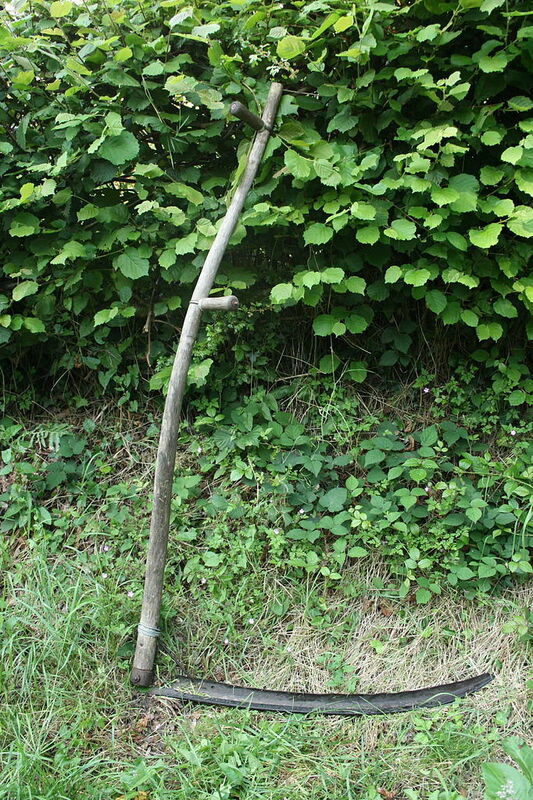 Bill Bailey wasn’t our relative but like one of our ancestors a short-lived scythe grinde(r)! Above – the start of our ancestor hunt, St James’ Church, Norton Woodseats. I’m not clear why it’s of interest to see an ancestor’s name on a gravestone – especially when you can often find the inscription online or even see a photograph of the headstone, nevertheless, it’s a starting (or really an ending) point and there is something oddly compelling about the quest! This is where Will and I searched the graveyard in vain for his 4x Great Grandfather’s grave, namesake William Frith, born 1807, publican, labourer and farmer, died 1857. He also married Mary Cocker in this church in 1827 and their son, James (more on him later) was christened here in 1829, and subsequently so were his seven other siblings. Above: View from St James’ Church gate to the Lodge House and stables of the former Norton Hall – owned or occupied in the 19thC by a succession of steel manufacturers, a contrast to the small labourers cottages the Frith family would have known nearby. It became a hospital in the early 1900s, now converted to up-market apartments within the enormous (220 or so acres) Graves Park just 4 miles south of Sheffield centre. Parts of Graves Park include 1000 year old woodland – one reason why generous Alderman and benefactor JG Graves bought the area in 1925 in order to protect the site which he then donated to the City of Sheffield as a park for the people. The steep sided valley was a favourite running route for Will. 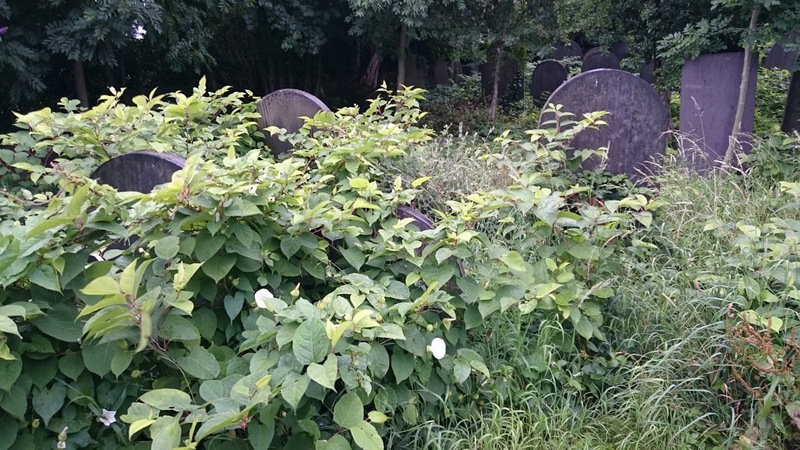 Another failed relative hunt – this time in Heeley churchyard, closer to town, to look for the grave of Mary, the wife of previously mentioned James Frith. According to her death certificate, she was ‘found dead in Great Oak Street, Nether Hallam and her cause of death was stated as ‘found dead on the footpath in Heeley, death not from violence’. She was buried here on 24th February 1858, leaving behind her husband James and their three children under the age of seven. These three children had all been christened in this church. The middle child was my Great Grandmother, Elizabeth; James was later buried in the same churchyard but with no gravestone. Above: Bristol’s not the only place for graffiti! 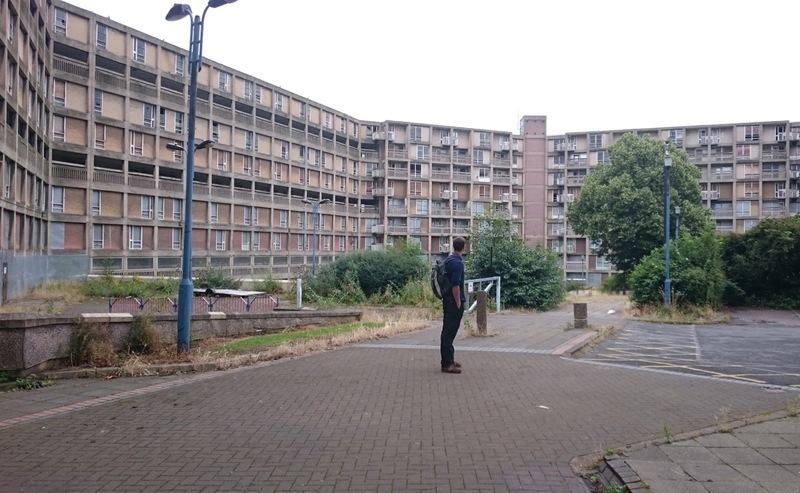 While there’s some renovation and refurbishment in the city there’s a surprising number of derelict buildings and empty ground in the centre of Sheffield. 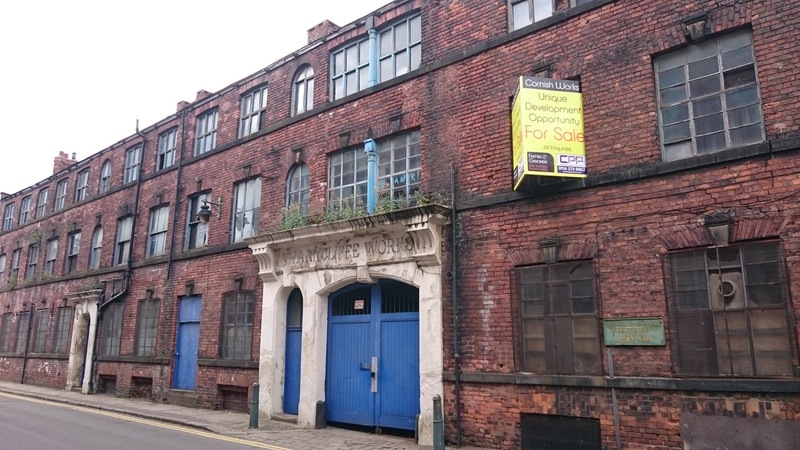 ‘The Hubs‘ – built as the Centre for Popular music in 1999, it closed the following year due to lack of interest! Now Sheffield Uni’s Student Union HQ. The Showroom – originally a car showroom opened in 1936, now a cinema and Creative Workspace – similar to Bristol’s Watershed. I don’t think Sheffield’s ever been a lovely place but it’s been further blighted by ineffective road schemes. On the horizon are the famous/infamous Park Hill flats. 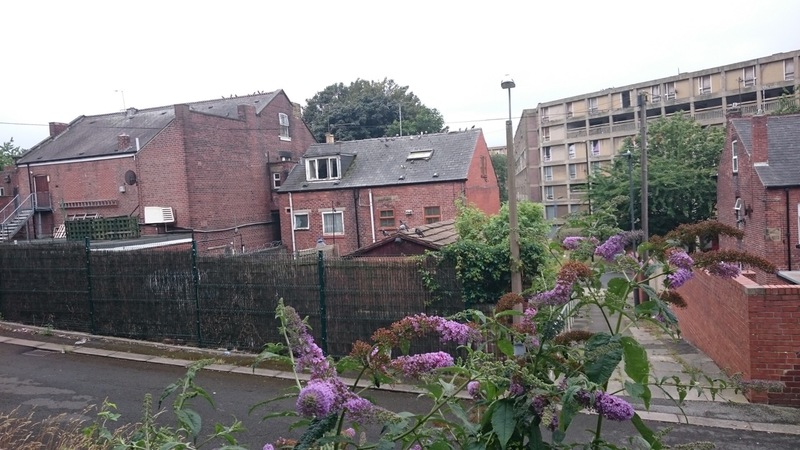 The flats’ predecessors were the home of some of Sheffield’s notorious gangs in the early 20th century (here’s an article written by Will Milner). Prior to that (1861) our relative, James Frith, now a widower, had moved from Heeley to live with his mother-in-law, 3 children and 4 other people in a small house on a road called Rough Bank; see an archive photograph of one of the houses in this area here. Rough Bank is now part of the grounds these flats are built on. The remnants of later Victorian housing in the area of Rough Bank with the now uninhabited section of Park Hill flats, behind. Above: The Park Hill flats (nearly 1000 units) were built in the late 1950s to replace some of Sheffield’s worst housing. When they were completed they provided homes for the people who’d lived in the area and care was taken to rehouse neighbourhoods together, with floor levels named after the old streets. The ‘brutalist’ style accommodation, inspired by Le Corbusier’s Machine for Living was a huge improvement on the houses they replaced and was very popular with the new occupants for some time. However, a few decades later the flats were hosting new gangs, involved in drug-related crime. Territorial disputes arose as members of one gang would adopt a stairwell and fight those from other gangs who’d appropriated nearby shared spaces and when the lifts didn’t work, getting back to your top floor flat with shopping and kids became a miserable ordeal. Tenants became hard to find and the by the 90s it was emptying and the fabric decaying. Despite these increasing problems, the entire set of flats gained listed building status in 1998 making demolition impossible. Refurbishment of the interiors was the aspiration and this has begun in one of the largest blocks. Urban Splash have been responsible for the regeneration of this block and further work is planned on the others, but recession has slowed things down so for now most are still boarded up. 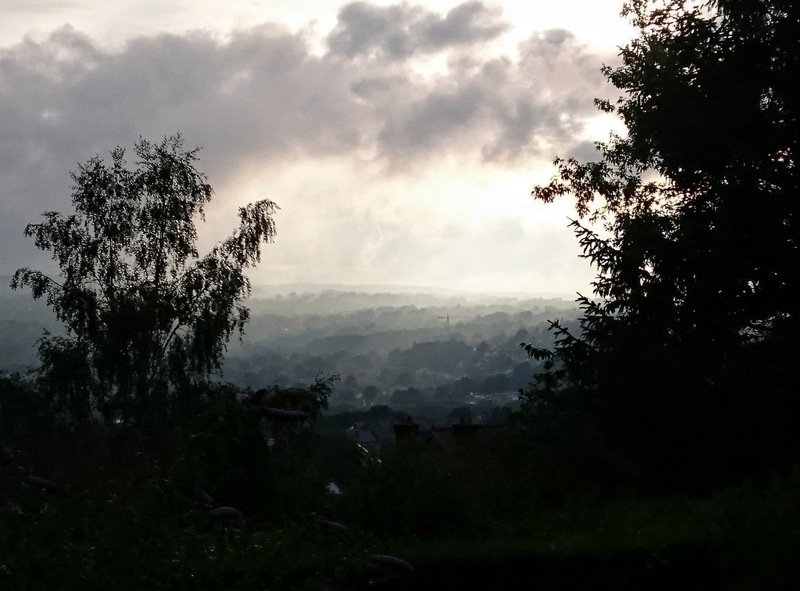 It’s a significant feature of Sheffield’s skyline, and such a large potential provision of housing that the city’s residents must hope development will continue. 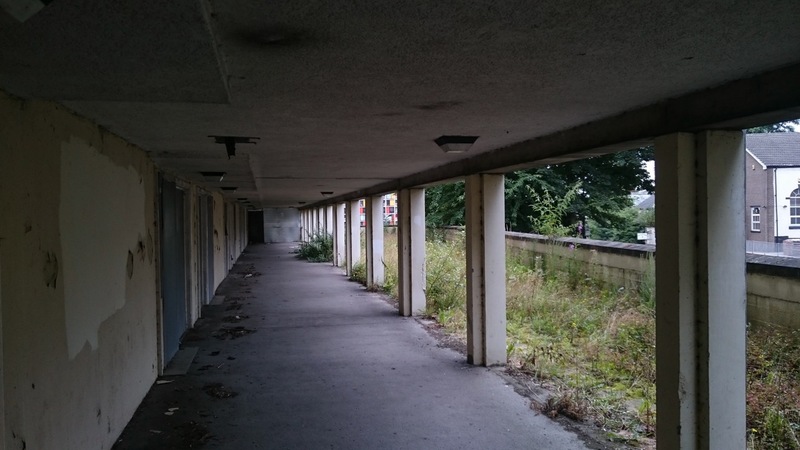 The new-look flats have a view out to their unrefurbished counterparts; although some of the flats are for rent as social housing, many of them are for sale on the open market. See this website for more on the rise, demise and alleged ‘class cleansing’ refurbishment of these buildings and go here to learn the sad story of the infamous grafitti “I love you will you marry me?” on the bridge between two of the buildings (see middle photo above), cynically exploited by a range of companies, individuals and agencies. Above: There are still a few pockets of Sheffield’s past that can be seen around the Canal Basin and Kelham Island area by the River Don; The Straddle, was used for loading grain from hoppers onto barges underneath the building. Sheffield castle site and ex market – man with largest Halibut fish ever caught! Above: various features that caught my eye in central Sheffield, see captions on each photograph and below for a few more details. Paradise Square was an unexpected find of Wills’ – some remnants of Georgian elegance, once used for public gatherings and the site of a rebellious Chartist meeting in 1839 when troops dispersed the crowds. St Jame’s Row, across the road from Paradise Square, leading to the Cathedral, is home to Sheffield’s legal people. Harry Brearley’s invention of stainless steel was a significant element in the development of Sheffield’s industrial strength and success. The brickwork vultures create a ghoulish juxtaposition with (in the distance on hillside) the Cholera Monument, commemorating the 400+ people who died of the disease in 1835. This appalling episode and what ensued were a source of much interest for son Will who made a fascinating podcast on the topic that includes the outcomes of the epidemic, the problem of body snatching, medical research and the eventual improvement in public health and sanitation. The River Don steam engine used for rolling out steel plate, with immense noise. Above: Old industrial Sheffield at Kelham Island in the River Don. Now an industrial museum, it was disastrously flooded and closed for two years after the Don burst its banks in 2007. Some of the adjacent industrial buildings are now being converted into or rebuilt as expensive flats, but preferable to losing the architecture to wholesale demolition. The Bessemer convertor, one of only three left in the world is an item largely responsible for the growth of Sheffield’s steel industry. The truly awesome River Don Steam Engine was used for rolling out steel plate, this monstrous machine was being demonstrated on our visit and it sounded and felt like an earthquake as it’s pistons thumped and thundered. But it was the displays about the grinding and sharpening of steel tools that brought home the miserable and dangerous work done by so many men in Sheffield up to the mid 19th century when mechanisation began; scythe grinding was the occupation of our relative James Frith at the time of his death (more on this to follow) in 1864, age 34. Although James Frith’s death wasn’t related to his working conditions it was a shocking event that remains one of Britain’s major disasters but seems to be little known; this is his story. On 11th March in 1864, my great, great grandfather James Frith returned to his lodgings at Malin Bridge on the Loxley River in Sheffield after a day’s (undoubtedly) hard work at Sorby’s toolmakers in the town – a company that still exists today. He was 34, a scythe grinder and probably expected to go to work again the following day, a Saturday, but was perhaps hoping, on Sunday, to travel the dozen or so miles to the village of Eckington where his second wife, Sarah, was staying at her parents’ home with their 12 day old baby daughter, 21 month old son, and his three other children from his previous marriage to Mary who had died six years before. I imagine he’d have had some supper provided by Mrs Armitage, the landlady of The Stag Inn where he was lodging and would probably have been in bed and asleep by the time, just before midnight, that nearly seven hundred million gallons of water swept down the Loxley Valley and on into the heart of Sheffield from the newly built Dale Dyke reservoir five miles north west of the town where the dam had collapsed. The Dale Dike dam breached. The reservoir was to provide fresh drinking water to the rapidly expanding population of Sheffield. It was rebuilt in the 1875. From Wikimedia Commons, the free media repository. The Stag Inn was completely destroyed, only the cellar walls remained (see photographs here), and James, along with another lodger, a servant and all 12 members of the Armitage family were killed; but they were not the only victims, the total death toll that night was around 240 people. Another sixty or so people died of related illness or injury over the next year. Eventually compensation could be claimed from the Water company by victim’s relatives but was often strongly contested by the board in charge. 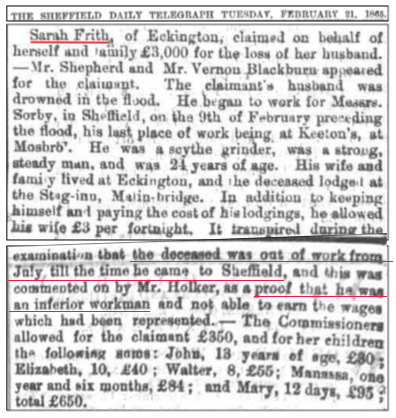 In James’s case his wife claimed £3000 for herself and her 5 children but was awarded a year later £650; the reason given for the reduced award is shown in this newspaper clipping, below, from 1865 – James had been out of work for 6 months prior to his arrival in Sheffield just 4 weeks before the flood, proof that he must have been ‘an inferior workman’. Report on compensation claim for James Frith. His age was 34, not 24. Incensed by this insult to my great, great grandfather and his family (albeit 150 years late), I did a little online research that revealed that Keeton’s, the company he’d worked for in Mosborough prior to the period of unemployment, was by 1860 struggling, partly due to the death of the owner but mainly because of competition from “the invention of Reaping Machines” and the making of hand tools by machine. The company only lasted a short time after this so quite possibly closed in around 1862 – 63, leaving James without work, and causing him to part from his family and return to Sheffield to seek work. I’d only discovered this astonishing flood story a few months before this visit (with online assistance from some keen amateur historians*) and it was part of the motivation for going to visit our family territory, so Will and I made an outing to Dale Dike Reservoir and Malin Bridge where the Stag Inn once stood. The valley of the Loxley River downstream from the present day dam. The dam wall today with a memorial monument. The devastation of the flood at Malin Bridge. Eight miles or so downriver from the dam is Malin Bridge where James Frith lost his life at the Stag Inn when it was destroyed in the flood. The crumpled photo in a display case by Malin Bridge is the only evidence of this momentous event that killed 102 people just in this area. So James’s three older children, John, Elizabeth and Walter, all under 12, were now orphans. But they all made their way into adulthood, married, had children and the men worked, at least for some years, in similar trades to their father – saw and file hardeners or grinders. I’d love to know how my Great Grandmother Elizabeth met the young George Lockett, who, counter to all the family ‘knowledge’ of the Locketts being ancestral Yorkshiremen, came from Manchester, in Lancashire! But met they did and married in 1875 when she was 21 and he 25. Our, almost final, visit was to the area that George and Elizabeth Lockett (my namesake until I married) lived and worked. It’s on the River Don, just along from the Industrial museum on Kelham Island and is probably the last remaining bit of old industrial Sheffield; but parts of it are currently being re-developed, so I was pleased to catch sight of this dour location before it vanished forever. The Wharncliffe Works, Green Lane, steel works producing stoves, grates and fenders. George Lockett, a labourer and blacksmith’s striker, lodged in this inappropriately named street in 1871, age 20. …this is all that’s left to see. Above: what remains, for now, and below, how it’s changing. Green Lane Works, “the most spectacular survival of factory architecture in the city” (Nicholas Pevsner). The pedimented entrance with bell tower is listed but the remaining buildings were being converted into flats at the time we visited, now complete I believe. High-tech, efficient living with ‘friendly neighbours and good community’ is what you buy into on the site of the Green Lane Works. The final fruitless and damp, but atmospheric search for family gravestones led us on a bus journey north east from the city centre up Spital Hill to the Burngreave area where the Locketts had moved to by 1891 and where my grandfather, also George, was born in 1887. The family lived in at least 3 locations in this area (Kilton Street, the very steep Ditchingham Street and on Spital Hill itself) in low quality Victorian houses that, undoubtedly for the better, were all demolished in the 1970s and replaced with estates making the old road layouts unrecognisable today. Also in this area was the Brightside Foundry, likely to have been where George worked as a ‘blacksmith’s striker’. He died in 1908, age 58 and was buried in Burngreave cemetery, joined in 1911 by, sadly, a 12 month old grandson he would never have met and in 1934, his widow, Elizabeth. Three years after his father’s death in 1911, my grandfather, age 24, was still a bachelor living with his mother and one sister. He was a clerk in a timber merchants, a less physically demanding occupation than his father’s – I think he may have had a health problem, I remember him in later life with a rattling emphysema cough and so far I’ve found no record of him being in the 1914 – 18 war. But somewhere, before 1919, family legend has it that on a ramblers’ group outing in the Peak District, he met Elsie Hemingway from Outwood near Wakefield (probably delighted to be escaping from and caring for her 12 siblings!) and they married in 1919, quite late in life for those times – he was 32 and Elsie was 30. It’s not clear why they moved straight away to Banbury in Oxfordshire where, at the time of their marriage he was a cashier, or how he subsequently came to work at the newly formed Morris Motors, 30 miles further south in Cowley; it seems a big move for two Yorkshire-born people to head to the semi-rural south of England with no evidence of any connections, but he never spoke about his Sheffield family so perhaps some rift had occurred; when my parents named me Elizabeth they were surprised to be told by my grandfather that he had a sister of the same name, but oddly it seems he didn’t tell them it was also his mother’s name. Banbury is where my father, an only child, was born in 1922, but they later moved to the village of Horspath and Granddad George continued work in the ‘white collar’ sector eventually becoming labour manager at Morris Motors until he retired in the early 1950s. They moved to Bexhill where, on the pebbly beach by the De La Warr pavilion, some of my own earliest memories begin. By an extraordinary coincidence, it’s also just a mile or two from where (with good fortune prevailing), the first of the next generation of this family line will emerge this summer! 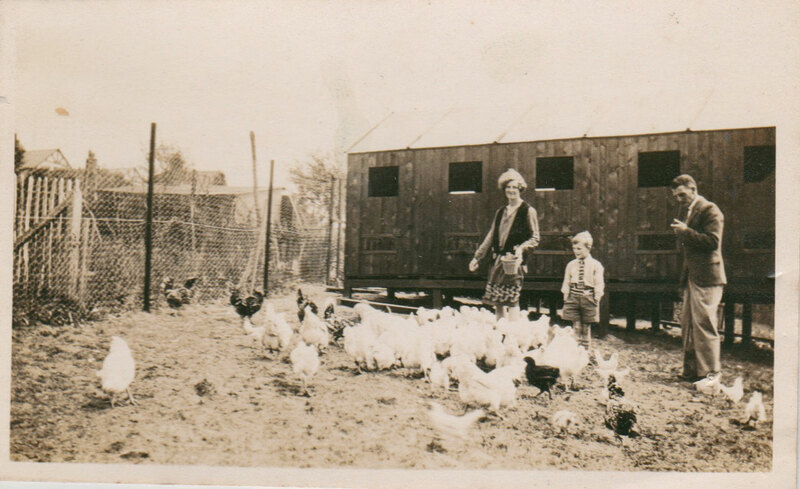 The only photograph I have of my paternal grandparents, Elsie and George Lockett, at their home in Horspath, about 1928, with their son, my Dad, and chickens! I’m not sure what I’d hoped to find on this visit when I set off, but over the 3 days I spent with Will in Sheffield, apart from some general sightseeing and poking around, we were often guided by my research into census records, birth, marriage and death certificates and old newspaper reports. These documents are a kind of map of the past – the blunt facts direct us to locations that are associated with lists of names known to have been our antecedents, however, it’s all a bit mechanical. But, furnished with those facts, and then travelling to and actually being in (some of) these places seemed, in my head, to subtly engage a different gear, release a current, shift the perspective – or something that allowed a clearer perception of what links past and present, people and places. So walking into St James’ churchyard in Norton Woodseats for the first time it was easy to visualise a small family group at the end of summer in 1829 entering the church for James Frith’s baptism; standing in the red-brick canyon of Cornish Street with the boarded-up ‘Works’ it was possible to briefly hear the incessant din of grindstones echoing off the now derelict walls, and feel the catch in the throat from the damaging dust. Or by the banks of the mournful reservoir I could conjure up for a frightening second or two the appalling tumult and rush of air made by the wall of water as it heaved through the Dale Dike dam. This sensory detail, even though imagined, seemed to help breathe some life into these distant relatives long after they’ve gone and left me with a potent sense of the past city and landscapes populated by people from my family who I now felt I knew a little better. Thank you to my inspired tour guide, Will, for his forbearance, Sheffield knowledge and excellent company. * With thanks to the excellent Sheffield Indexers site and forum, and especially to Karen Lightowler, a family historian, who spends her spare time tracing the descendants of the Flood victims, and sent me an invaluable 100 page document about James Frith, his family’s history and descendants. This entry was posted in History, Placescapes and tagged 19th century trades, family history, Sheffield. Bookmark the permalink.